In a love poem sequel to Tate’s Avenue Heaney demonstrates how to say ‘I’m stuck on you’ in twenty words. Let us imagine that the Heaneys are in Glanmore on an autumn afternoon – one of them is thinking ahead to winter and the comfort of an open fire; the other is at his work-desk, composing the poem that is taking shape in his head as he follows the sounds of physical labour. There are two protagonists (ostensibly anonymous but we know darned well who they are! ), an I and a you – a ‘match’ is possible in all its senses. What the poet hears but cannot see conjures up associations in the poetic mind: the familiar sounds of axe thumps recall wave hits through/ a night ferry. The source of the sound is held back until the final line (splitting firewood. The seven words between celebrate closeness and endearment of man and wife using the vocabulary of chopping and its alternative usages. ‘she’ is a person whom I cleave to – the verb is appropriate both to chopping and bonding . 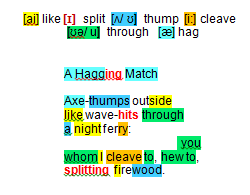 Heaney has a second verb up his sleeve (hew to) – different word, appropriate to both contexts, same message, same bond. The message to the lumberjack-wife is doubly clear!